Julien Labro (accordion); Dave Bennett (clarinet); Jeremy Kittel (violin); Evan Perri (lead guitar); Neil Mattson (rhythm guitar); Greg Cook (acoustic bass). Jazz Accordion legend, Art Van Damme wrote: The “Detroit Swingtet” features six of the most talented young jazz players in the country. They compliment the gypsy style of guitar with accordion, clarinet and violin which creates a unique sound that incorporates many various influences. This group has written some very nice arrangements and their playing brings back memories of Benny Goodman and Django Reinhardt. If the accordion world is looking for a new star… Julien Labro gets my vote! This project focuses on the European-Gypsy style of Jazz, but reveals a great deal of American influence as well. These players represent the finest talent in their field and they all give virtuoso performances. 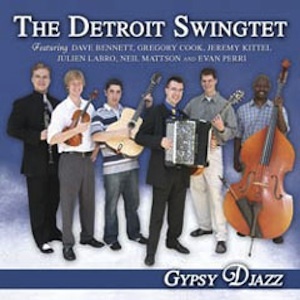 The Detroit Swingtet captures the spirit of the Hot Jazz bands of the early twentieth century by blending the unique sounds of accordion, clarinet, violin, bass and guitar. The acoustic sextet takes you to every corner of their musical interests while maintaing a reverence for the “Gypsy Jazz” of Django Reinhardt. The Detroit Swingtet draws on a repertoire that ranges broadly from American swing to European jazz and combines them with blues and classical influence. This talented group of musicians approach their craft with a historical and creative context which leads to a musical direction that takes the listener on a journey through the player’s various tastes and culture. Every selection represents the musicians who are performing them and each one is delivered with an energy and feel that will bring enthusiasm to those who experience it.